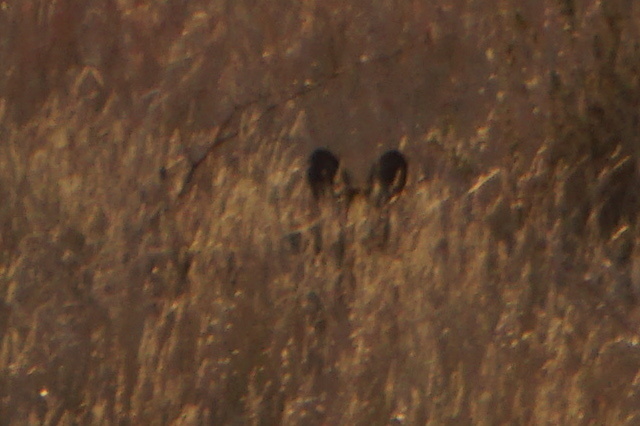 We were on our way back to Horseshoe Lagoon for sundowners to conclude a very productive game drive when Karen saw ears sticking up in the grass. What’s that Avi? My eyes immediately knew what it must be but my mind wasn’t ready to believe it. 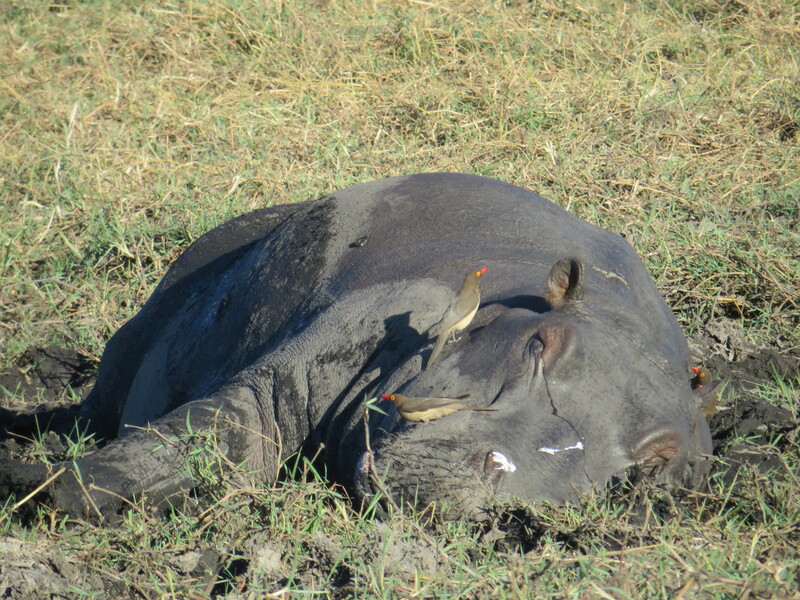 We had already seen 126 elephant, 110 baboon, our first buffalo, zebra and giraffe in the park to go along with the hippo, crocs, kudu, lechwe, wildebeest, and impala – we couldn’t really be so lucky. 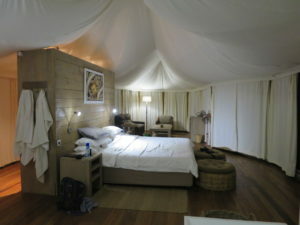 Nambwa Lodge is located in a great spot along the Kwando River in Bwabwata National Park in the Susuwe Triangle area. The local community, which has the concession and was running a community campsite there, approached Dusty Rodgers whom they had known from his previous work developing lodges in the area (as he said to us, in Africa relationships are everything) to own and operate a lodge here – they wanted a bigger revenue generator. It is beautiful, luxurious and perfectly integrated into the bush – no fences, all of it on raised walkways to allow the elephant to use their existing paths and targets a Hemingway-Era Safari Chic atmosphere. They also gave us a very good price (though still more than anywhere else we stayed) due to our situation allowing us to book on a dinner/bed/breakfast basis and then conduct our own game drives in the park. Despite us paying for a single shared tent, when we arrived they were nice enough to give us a separate luxury tent for the kids so they could have the adventure of sleeping out on their own in the wild and we could have our privacy. The food was excellent, the environment serene and the service befitting a luxury property. Signs of abundant wildlife were everywhere, though for the first few game drives we were left wondering where everything was hiding. Sure, we saw plenty of impala and baboons as well a few other antelopes and a small number of the supposed hundreds of elephants. 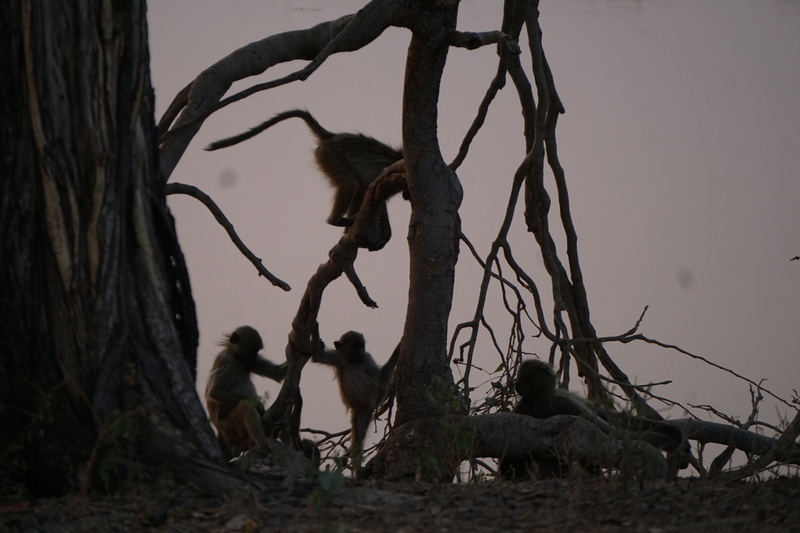 Then, on our final afternoon game drive it was as if someone had turned a switch on in the place – maybe they did since Dusty’s wife did give instructions to Avital and Eliav to count how many of certain animals we saw. It started almost immediately when we stumbled into a herd of ~35 elephants straddling the road (this also provided the only negative to the entire few days when the guide/driver of a game vehicle from Susuwe Island Lodge, north of Nambwa, came behind us to the elephants and tried to push me to move forward, never mind the elephant blocking the road who was already annoyed at our presence; if their guides want to endanger their guests that’s their business but to ask me to endanger my family so they can get a slightly better photo is obnoxious). 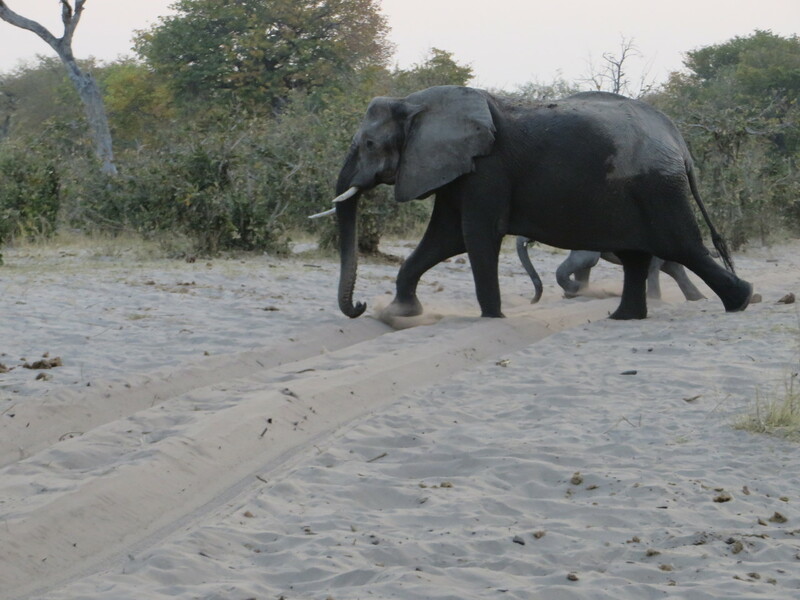 It never stopped from there, elephants were everywhere and so was everything else (including species the owners hadn’t yet seen in the park) – Avital didn’t just record the numbers for the directed species she recorded everything. Our host was so pleased with the results, she had her paste the list in the guest book, write about the experience, draw pictures and intends to scan that page and feature it in the information booklet put in the tents. 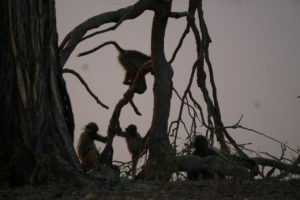 It was on the heels of this, when we were heading up to Horseshoe Lagoon, the picture perfect place to get out of your car and watch the sun go down with a drink in your hand – baboons playing at your feet, elephant drinking and bathing in the water as the bright orange fills the horizon, that we saw it. As soon as I saw the ears Karen was directing me to I said it – but I still didn’t believe it. I hopped out of the vehicle and climbed up top for a better vantage point, in the shadows of the tall grass with the dwindling sun I could imagine it being something else – an oversized fox, a small hyena or aardwolf – but as it walked along I got a clear look at its distinctive markings leaving no doubt at all that we were watching our first African wild dog. This was Karen’s one species that she had to see before she could go home – one we had been targeting since our first trip here 14 years ago – and it was beautiful. Though I did have to walk down to the river to explain to the people on the boat from another lodge why I climbed my vehicle and was jumping around like a lunatic – just a shame they didn’t see it too and only saw me. Avital has now seen her pangolin, Eliav his rhino and cheetah (at least someone was realistic) and Karen her wild dog. That just leaves my must see animal – and I have promised the kids I would reveal it on the last day. Nambwa, made a good replacement for Moremi and will definitely go down as one of our favorites. We enjoyed a leisurely morning, and with a jump start from the staff (more on this below) we left the 4×4 Getaway behind. 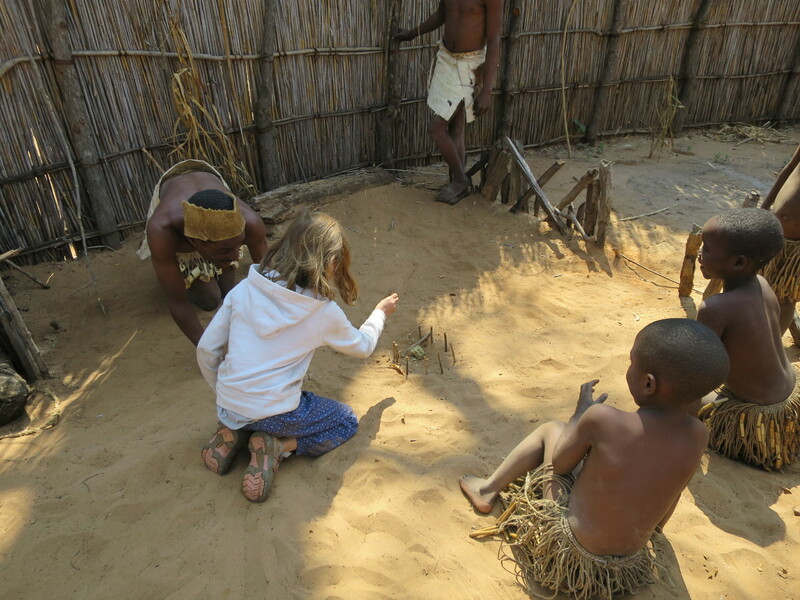 On our way to Botswana we visited the Mafwe tribe’s living museum where we learnt about the cool traps they use for hunting among their other traditional crafts and culture. This is the second of the Living Culture Foundation Namibia museums we visited; this German-Namibian organization seem to be doing a good job in providing villages both the tools and the platform to execute functioning cultural displays – a fairly difficult enterprise to pull off as you walk the line between human zoo and interactive experience. With our unreliable battery, we were not in a position to turn our engine off as we went through border formalities at the Ngoma border between Namibia and Botswana. At the Namibian post, we asked a fellow traveller who was waiting on their friend to keep an eye on our running vehicle as we went in – he promptly laughed at our predicament and sped off almost immediately. African border posts are always unpredictable, and there is a lot of advice out there on how to make them go smoother. One popular sentiment is to have a cache of cool drinks to offer the officials who are often sitting out in the hot sun all day bored looking to have some fun with you. In fact, our friends who sped off did try to awkwardly pull off this trick at the Botswana post – after getting their formalities finished they went out and came back with cans of cold soda remarking how hot the officials looked (in their air conditioned building) as they handed them over. We, however, learnt the true key to a smooth process – cute little kids. It worked so well that we had no problems as the kids got a sneak peek behind the desk (the police even gave us no hassle over our car not having a usable battery) and our kids left with those cold sodas. With another jump start the next morning we enjoyed a day in Chobe, first driving from the Western gate at Ngoma to the East via side tracks of varying degrees of dubious condition. Handling the off-road tracks in Chobe, and the ones in Bwabwata the previous few days, has been a breeze with the Hilux – though it sometimes took longer to get out of first gear then I wanted on sand it never had me in a bad gear and we never even flirted with getting stuck. 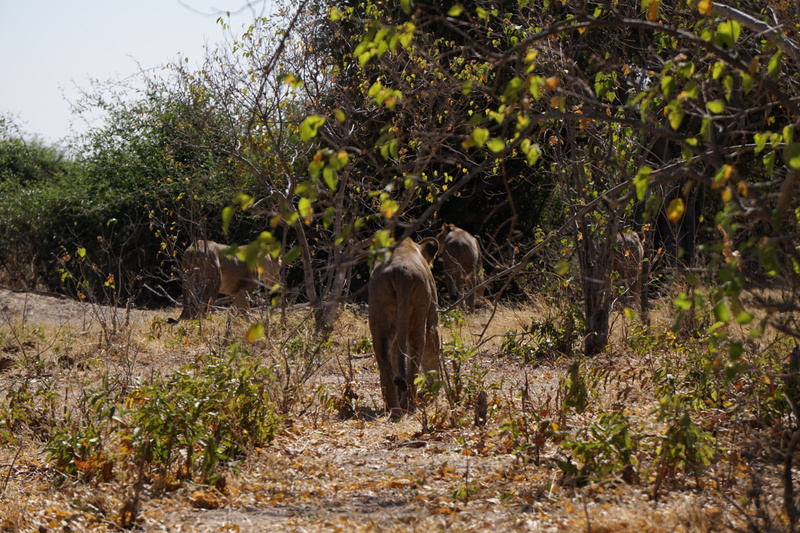 On the drive, we saw hundreds more elephant and buffalo among the masses of antelope, giraffe and baboons, but the highlight of the day was the seven powerful lionesses who crossed the road ahead of us and sauntered off into the bush. Then in the evening we took a sunset boat trip with a Belgian family of four who were also overlanding (though only for a month) with their kids – we once again saw hundreds more of the 60,000+ elephants in Chobe and the buffalo herd of 250+ as well as a croc wrestling a tiger fish into submission and another beautiful African sunset. In between the outings I was introduced to Kasane’s local Chinese syndicate in – they were able to replace my battery, exchange my Namibian Dollars for Pula and even served up very acceptable pizza and briyani for dinner – exactly as you would expect from the Chinese in Botswana. After a relaxed day today, we are heading into Zimbabwe and Victoria Falls for a few days followed by our next trip into the wilds of Hwange.